This is the story of a border collie who serves as the Collie Lama™, for as every shepherd knows, the collie is called to serve, not to reign. 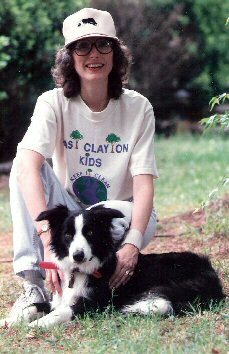 In these pages you will learn about Ian MacGregor and the border collie who inspired this tale. You will also learn about Jinty, the agility champion who lost her way through no fault of her own, but who found the Collie Lama™, herself, and a new path. Enjoy these pages and return from time to time, for the Collie Lama™ always has something new to tell us. Ian came to live with Heather and her husband John in the Spring of 1991. The family quickly bonded, and Ian rapidly learned the basic commands one would expect in a well-trained dog like "come", "down", "heel", and "stay". Soon he began to fetch a ball that was rolled on the ground and then graduated to a frisbee rolled on edge. While Ian was learning to be a family dog, he was also teaching his new masters that border collies have lots of energy and need lots to do. 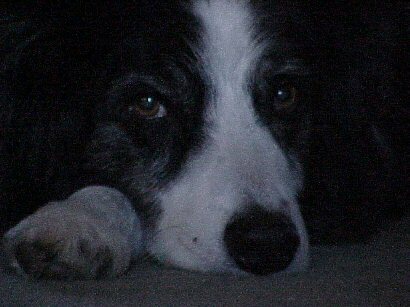 He also taught them that border collies learn much better with praise than with punishment. It wasn't long before Ian was catching a well-thrown frisbee in the air and enjoying long walks in the neighborhood with his new family. On these walks Ian would meet other neighbor dogs. The stories of many of these dogs have been woven into "Tails" of the Collie Lama™. As Ian grew to be an adult, he continued to bond with Heather and John and was able to participate more fully in the day to day activities of the family. He loved to go on long walks with John and Heather and particularly enjoyed running along with Heather as she rode her bicycle. He also loved to go camping and hiking at places like Georgia's F. D. Roosevelt State Park, Pine Mountain, Georgia, and Cochran Mill Nature Center in Palmetto, Georgia. While Ian didn't compete in frisbee events, he became quite acomplished catching the frisbee to the extent that neighborhood children would visit the home and ask, "Can Ian come out and play?" as if he were just another of the neighborhood children. Heather had many children come to the home for speech therapy sessions, and sometimes Ian was the catalyst to get the them to cooperate during their therapy sessions. He was almost, but not quite, a therapy dog. Border collies are extremely active dogs and extremely intelligent. They can best be assimilated into a family that is very active and are not normally reommended as pets. They are, after all, working dogs. They need to be busy, and most families don't have the available time to keep them occupied. Fortunately, John and Heather were able to challenge Ian enough physically and mentally so that he was a very positive force in the family. 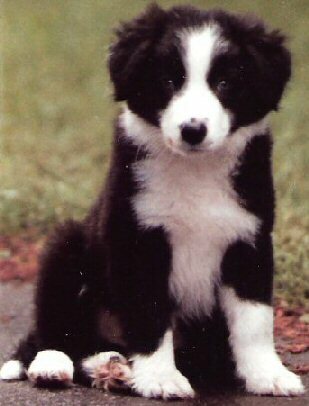 Border collies are are so active that they are typically not long lived. The Russells were very fortunate that Ian lived to be quite old and though he slowed down later in his life, he was able to participate in most family activities until the very end of his life. He went to herd God's sheep on March 25, 2006. He was 15 years old.